Announcing the ViveDC Winter/Spring Cohort Startups; Accelerating high-growth potential technology startup teams. 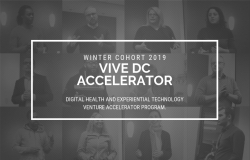 Reston, VA, April 16, 2019 --(PR.com)-- ViveDC is excited to announce upcoming graduation of the Digital Health and Experiential Technology participants in our Winter/Spring Cohort. They have 11 startups that were selected from a pool of over 150 applicants. ViveDC is a mentorship-driven 90 day global accelerator with this cohort being conducted in Rockville, MD, yet accelerating startups from many geographies. Throughout the program, startup teams not only learn battle-tested best practices and tried and proven methodologies to build scalable and defensible success, they test those in market, and are held to rigorous deliverables and metrics. They work hands on with venture mentors, peers, and accelerator leadership to define strategies, test them, and iterate on their business models, practicing the mindset of market over product. Citiskopes helps local events and cities engage and re-engage millennials to increase sales and brand recognition through immersive technology providing users unique and hyper-local enriching experiences. Easymove is a marketplace for on-demand local, reliable, low-cost full-service moving and delivery help for consumers, and a workforce for moving companies. ResEssential provides brands access to consumers at home through curated resident programming and experiences. SkyKandy provides a mobile platform where pilots can connect and do what they love by renting locally owned aircrafts. Reforming properties to provide authentic, enriching, and quality experiences for vacation travelers, and help owners increase value of their investments. Solves the problem of archaic and disorganized audition procedures for Casting Directors and provides the performer the status, outcome, and feedback for each Gig2Gig audition that they attend. Viv ships to small businesses all the elements needed to enjoy their own sustainable attractive workplace. At Tipboxme, they are digitizing loose change - making it easy to give and receive tips through a simple swipe on your phone. Automates and optimizes mundane human touch points within primary care physician processes, allowing physicians to focus on patient outcomes. Healing playbook will deliver your roadmap to recovery through on-going collaboration between patient and providers. ViveDC @vivedc| https://dc.vive.vc We help startups beat the odds.